One day early in 1993, Susan was sitting at the front desk when a young redheaded guy came in. She watched as he tentatively browsed around the gallery, frequently glancing her way. She said to herself, “That is a young artist trying to get up the nerve to approach us to show his work.” After about 10 minutes, she went over to him and asked if he was in fact an artist who was seeking representation. He gratefully acknowledged… “YES”. Susan then said she would be happy to look at his slides……and he quickly handed her over the slides he had prepared. Well… he said he had 2 paintings finished and was working on a 3rd – that was 14 feet long! I told him to quit his other jobs and finish the painting quickly so he could get them back for me to sell. At the age of 18, Tony prematurely decided to get married just out of high school. That same year, his first daughter was born. This meant it was going to be very difficult to support a family at such a young age, but in his heart, he knew what he wanted to do. From the age of 4, Tony knew he was going to be an artist. Throughout his childhood, he drew constantly and made art in many ways. Prior to graduating high school, Tony visited New York’s galleries on a class trip. He saw an exhibition of Chuck Close and was able to meet Chuck. He told me it was on that day—that he knew, and decided, that he was going to devote his life to being a Photorealist artist. Even with his young family, Tony managed to put himself through art school. In those days, there was no school anywhere actually teaching artists HOW to make realism. Yet he was determined to complete a traditional BFA, even if he had to do so while working two jobs to support his family (that now included two daughters). To graduate, he approached his professor with a novel request. He asked if he could work from home, sending in work, but not attending classes, as he had to continue to provide for his young family. It was a unique suggestion at the time, but the professor saw his determination and potential, as we did, and agreed. In May of 1992, Tony got his degree from SUNY Binghamton after a 5-year struggle. I don’t think he ever did or will need it. I think our response was better than the degree. Below is one of those first three paintings that Tony brought in. From that day on, Tony Brunelli, along with Bertrand Meniel, became the prominent second-generation cityscape Photorealists. They built upon what Richard Estes led the world in from the late sixties. For 6 years, he painted about 3 cityscapes a year, all of upstate New York small town images. Tony had never really been anywhere, outside of a few short trips to NYC and their family vacations on the East coast. In late 1999, I was approached by the Meridian International Center. 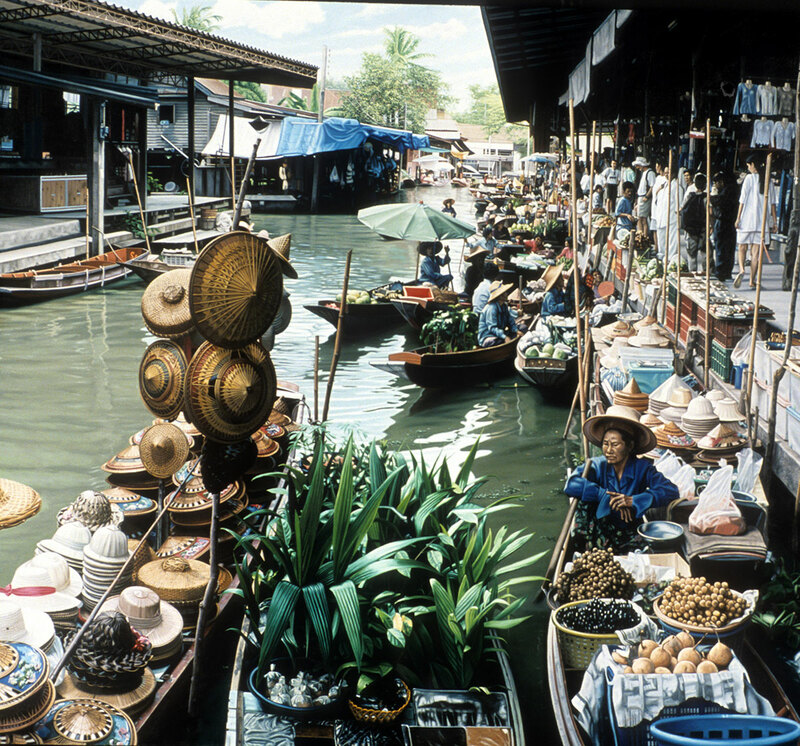 They were preparing to present a traveling show of Realist American art in D.C., Southeast Asia, and China. As has been the case since the early 70’s, any museum or entity wanting to loan Photorealist paintings is generally in touch with me. And, I helped Meridian put together a strong selection of Photorealism, which has not yet been outdone in any of the cities where this show toured. Once the tour was set to begin, Meridian asked me if one of the artists from the exhibition would visit their shows and give lectures (all expenses paid). I was initially met with negative responses from the older artists, who had all been to many shows internationally. So, Tony got the gig! This became his next step towards his “PHD.” He had never been anywhere, and NOW… Tony would be traveling to Vietnam, Cambodia, Singapore and more. WHEW! During those trips, he made friends with many artists, who he has continued to visit over the years. And from that experience, his first non-upstate New York painting emerged. 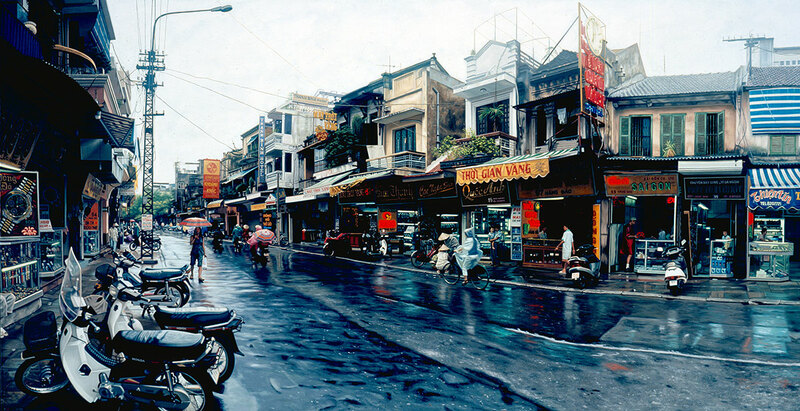 The subject was of Saigon (Ho Chi Minh City), Vietnam. Since then, Tony has traveled the world to attend the numerous museum shows he has been included in, and he has spent a significant amount of time visiting the other Photorealists in France, Italy, and Spain, amongst others. These travels have enabled him to make spectacular paintings from each of these places. Each and every painting is now an advance in some way over earlier ones, and along with Bertrand Meniel and Ella Spence, they are the triumvirate of Photorealist cityscape painters in the digital age. Left to Right: Tony Brunelli with Bertrand Meniel and Don Jacot at the Thyssen-Bornemisza Museum in Madrid, Spain, 2012.